We took to a science lab to find out the most effective strategy. 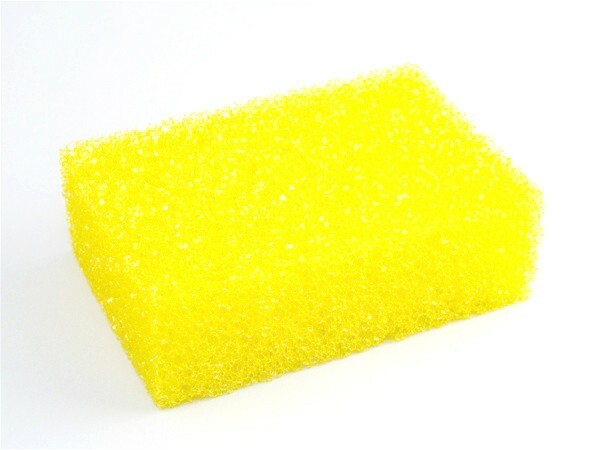 Put a sponge into a regular dishwasher load, using the “heated dry” setting. In the microwave, saturate the sponge (we used 1/4 cup of water for scrub sponges and 1/2 cup for cellulose); heat on High for one minute (scrub) or two minutes (cellulose). Keep an eye on it. A five-minute soak in full-strength vinegar averaged 99.6% bacteria elimination; in full-strength ammonia, 97.0%. The washing machine proved least effective, killing on average 93.0% of bacteria. No matter how diligent you are about cleaning, your kitchen sponges won’t last forever. Clean sponges weekly, and toss shabby ones (about every two to eight weeks, depending on use).